In today’s growing market, companies need to find innovative ways to improve efficiency to remain competitive and bring value-add solutions to their projects. Greiner has done this is by using technology, such as BIM and VDC, to mitigate potential field issues and reduce construction schedules with prefabrication. However, we are leading the industry in solving the everyday project issue of waste to deliver greater value to our projects and increase productivity from material handling. Using Revit and Dynamo, we have created algorithms to improve modeling efficiency as well as to minimize material waste. Revit is the primary program Greiner Electric uses for all BIM needs. Dynamo is a visual programming interface that works inside of Revit where the user connects nodes to create a workflow. 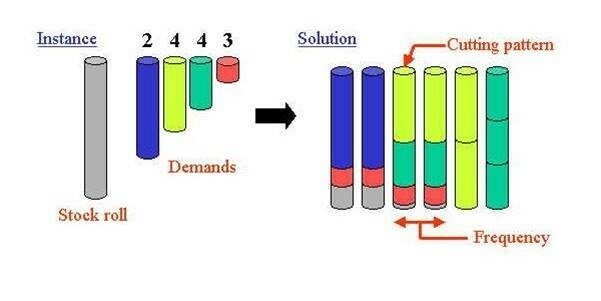 An example of how this process works is shown below. The two inputs (“X” and “Y”) are connected to another node that adds the two values together to produce the value on the right, the Output. Using this tool, we create a workflow to mitigate a common industry problem referred to as the “Cutting Stock Problem”. Here is how we are addressing the problem. Most material ordered from manufacturers or vendors come in set stock lengths. Taking these larger stock pieces, we then need to cut them down into various smaller pieces. The problem now is to figure out how to cut the various lengths from each stock piece to minimize waste as shown in the image below. For example, if a project needed multiple pieces of strut cut into various lengths (see table), and a piece of strut comes in a stock length of 120" (10'), how can the material be cut in such a way that we minimize or possibly eliminate waste? If we add the lengths of all 35 pieces shown in the table, we get a total of 840" (70'), meaning that in theory we should be able to get all of the required pieces from 7-10' stock pieces of strut. With the power of Revit and Dynamo, we solve the "Cutting Stock Problem" and minimize material waste, and in this instance, eliminated waste altogether. Under each strut heading is a list of the pieces to be cut that results in zero-waste. While material waste seems like a trivial matter in comparison to other issues commonly faced on the construction site, this one algorithm eliminates the need to add the typical 10% extra to a material order and turns wasted material into project savings.